The Dinobots are a team of mighty warriors. They are not quick to form alliances with others. But now, with their own freedom in peril, they will charge into battle alongside new allies: the Autobots! Get a dino-charging force of Transformers heroes with the Dinobots Unleashed pack! 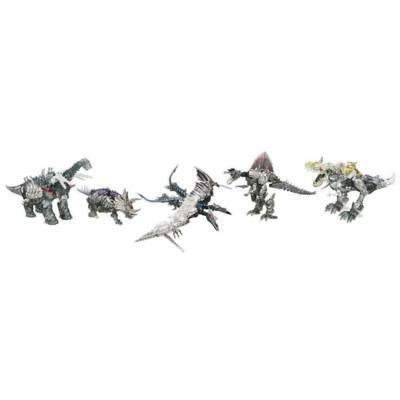 This 5-pack of heroes includes 2-in-1 Grimlock, Slog, Strafe, Scorn and Dinobot Slug figures. Under the fierce leadership of Grimlock, the Dinobots will fight Decepticons wherever they find them. They can all change fast from robot mode to raging dino mode and back again! Unleash your Dinobots on their foes! Transformers and all related characters are trademarks of Hasbro. Includes 5 figures. Dinobots Unleashed pack includes 5 Transformers figures Includes Grimlock, Slog, Strafe, Scorn and Dinobot Slug figures Scorn and Slog figures change in 18 steps Dinobot Slug and Grimlock figures change in 16 steps Strafe figure changes in 13 steps Ages 8 and up Manufactured under license from TOMY Company, Ltd. 2014 Hasbro. All Rights Reserved. 2014 Paramount Pictures Corporation. All Rights Reserved.